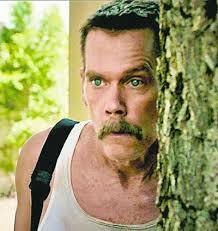 A corrupt cop (Kevin Bacon) had his car stolen by two eight year-old boys in the dark comedy Cop Car. What do you get when you mix two eight year-old boys, a corrupt cop, a crooked man, a female witness and an empty cop car all out in the middle of Colorado? You get a bizarre dark comedy called Cop Car. The film starts with two eight year-old boys, Harrison and Travis, walking along the Colorado farm land cussing and having fun. During their fun, they notice an empty sheriff car not running and nobody inside. They go in to check it out and find the keys. They’re able to turn it on and the two start their fun. We found out how it got there. A corrupt sheriff named Kretzer appears to have killed two men; there’s one lifeless in the trunk and one Kretzer buries in a hole. Kretzer returns to where his car was parked only to find it gone. All that remains is his empty beer bottle. He goes to town to try and steal a car for himself. Nobody can know of his plot. Once he steals one, he goes to town and alerts the police of what happened. Meanwhile the boys are driving superfast on the highway and catches the eye of a passing motorist who questions what she sees. She reports it to police but they think she’s crazy. Even she’s seen sitting at a diner questioning what she saw. Kretzer believes it and sends the boys a radio message letting them know they’re in trouble. But they don’t hear it because they’re playing around with the police tape and assault rifles in the car. All of a sudden, they hear a thump coming from the trunk. The other man is alive and scared as hell. However he’s shocked to see two boys looking at him. The two help free the man from his ‘shackles.’ Sheriff Kretzer sends another message to the two boys, this time more comforting. They boys say to meet him at a location but it’s at the gunpoint of the man who threatens them and their families if they don’t do as he says. Then he goes with the two assault rifles hiding behind the windmill right in the remote rural highway. SPOILER ALERT: The ending of the movie will be revealed from this point on. If you want it a complete surprise, do not read any further. Sheriff Kretzer arrives. He sees the two boys in the car but suspects something suspicious. Coincidentally the witness is driving on that same highway and bumps into the sheriff car again. She gets out relieved that she is not as crazy as they say she is but ready to give those two boys a good talking to. However she’s shot and that’s when the shootout between Kretzer and his hostage occur. The hostage is dead. Kretzer is badly injured and the two boys are scared as hell. They shoot the car window down by accident and Travis is accidentally shot. It’s up to Harrison to drive back to town for safety. But not without one last pursuit by Kretzer which proves fatal for him. The film ends with Harrison still driving over 70 mph with the lights flashing and the sirens on. I don’t think the film was intended to give a social message. I don’t need to see this film to know how corrupt a lot of cops can get. What I think director Jon Watts and co-writer Christopher Ford are trying to do is tell a story and have fun with it. They have fun showing the wonders of what it’s like to be a child to the point their cussing and diarrhea joke seem like a disgusting but charmingly funny reminder of how we were kids. They have fun showing the two boys having fun in this bizarre and even dangerous situation. They have fun with a corrupt policeman whose stuck in the middle of his crime right and tries to ‘set things right.’ They have fun with the witness who questions what she saw. They have fun with the hostage in the trunk who doesn’t seem to have a clue what’s going on. They also have fun with the audience. One of the elements in making it a dark comedy is that they have us at the edge of our seats. They show two boys driving off in the sheriff’s car shouting ‘this is our cop car!’ and leaving us the audience nervous and afraid of what will happen next. They show police tape by the car as Sheriff Kretzer sends the boys a message only for us to learn the two boys are having fun with it. They show the boys playing with the guns, even the assault rifles, leaving us afraid a bullet will go off any minute but it doesn’t. They show the hostage threatening the boys and demanding they relay Kretzer a message only to appear clueless in what he’s about to do. I think that’s one thing Watts and Ford try to do: play with our fears. I know I was afraid as hell what would happen next. Even that scene at the beginning of the boys trying to crush the snakes in the snakehole was the first sign of the fun Watts and Ford were going to have with us. However both Watts and Ford do set a moment where the fun ends and things become more serious: right at the shootout. The carefree fun even ends for the boys as it finally sinks into them the danger they’re about to face. I think the moment when it gets darkly serious was timed right. The film shows a lot of surprises. Firstly we’re all surprised not to see the two boys land the car in any dangerous hill. We’re also surprised the hostage in the trunk is alive right while the boys are playing around. We’re surprised to see the witness actually bump into the site of where the boys are with the car. We’re surprised of the hostage’s plans of his own on Kretzer. We’re surprised the sheriff not only survives the shootout but is fit enough to drive. We’re surprises that Harrison is able to turn to avoid the truck while Kretzer smashes into it. We’re also surprised to see despite playing around with the car and the guns, the moment Travis gets shot is when he uses it for help. We’re also surprised to see the best driving of the boys come from Harrison as he’s rushing back to town for safety in the pitch dark and the police lights flashing. The film is full of ironies. However one of the best qualities of the film is not just of what we know but of what we don’t know. In fact the film will leave us asking a lot of questions. Why did Kretzer kill one man and hold another hostage? What exactly was the hostage after that he was trying to kill Kretzer? Why did the witness have to get shot? I think it’s trying to have us decide for yourself why things were this way. Even the ending leaves us asking a lot of questions. Will Travis be okay? Will Harrison drive back to town safely? I think that was the quality of the ending. I believe it lets us create our own ending to the story. Watts and Ford delivered a good fun dark comedy. I wouldn’t call it a stellar movie but it’s hard to notice the imperfections. Kevin Bacon’s performance as the corrupt Sheriff Kretzer may be Golden Globe worthy but I don’t think it’s Oscar worthy. He made the right comedic choices in his character for it to work and fit with the story. Shea Whigham was funny as the bumbling hostage. Camryn Mannheim made the most of her brief appearances in her minor role. The two boys, Hays Wellford and James Freedson-Jackson, owned the show. It’s funny how they cussed, played dangerously and told a crude joke but still managed to maintain the innocence of childhood. Cop Car first got a lot of good buzz at the Sundance Film Fes5tival and has been an attraction at various film festivals this year. It was given a box office release in August but only grossed up to $150,000. That’s odd for a film starring Kevin Bacon. Cop Car is a surprise treat. I’ll admit the movie left me so nervous and afraid of what will happen next, I wanted to walk out. Nevertheless it was a delight to watch. The French/Arabic-language film Of Gods And Men doesn’t have the type of subject matter that would normally bring in a large crowd. The film is about Cicstercian Monks living in a small village in Algeria facing threats from fundamentalist terrorist groups. Nevertheless those lucky enough to see it will love it for what it is. This film is based on an incident that happened in 1996. Seven French monks from the Algerian village of Tibhirine were found decapitated. The film focuses on the days just before they were killed. They were a group of eight monks who lived in a monastery in Tibhirine. They devoted their lives to monk rituals of gardening, distributing medical help to locals and religious devotions. They were present at the village during times of celebration and they conversed with the villagers regularly. They all did this during a time of the Algerian Civil War. Religious extremists were committing acts of brutality amongst foreigners and their own people. The pressure was felt by the monks. Christian, the leader and resident religious scholar, tells authorities they will not go. However this is hotly debated with the other monks as some fear for their own safety. Christian then gives the men time to decide whether to leave or not. News gets grimmer by the moment. They even face potential threats of their own. Authorities of the Algerian government request they leave for their lives. The villagers however convince them of how vital they are to the community. In the end, as one brother pays a visit to the monastery, they all vote to stay. Late in the night, seven of the nine are found, captured and taken away. Those would be their last minutes known to be alive. The film has many great qualities. Its best technical quality was the cinematography as it added to the film in showcasing the landscape in its best splendor. The film was well-directed and well-written by French director Xavier Beauvois. The script he co-wrote with Etienne Comar was excellent and very no-nonsense as it cut at the heart of the monks and the village they served. 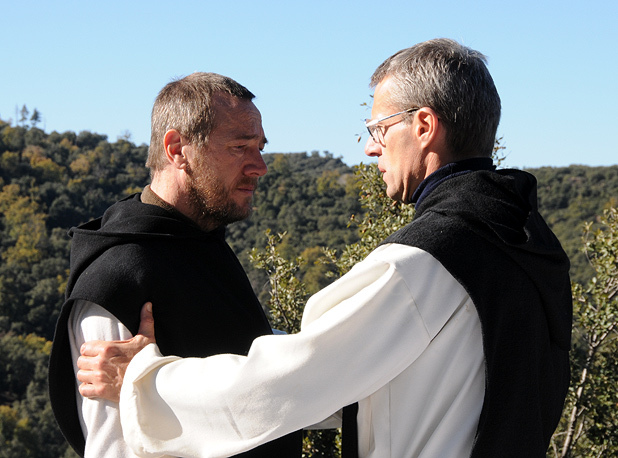 As important as it was to show the events that happened leading up to the times, the script’s biggest focus was on the monks and their lives. It was more about people than events. Even the scene of the last dinner with the music of Swan Lake in the background was done with the focus on the men. The biggest strength of the movie is definitely the acting. Of all performances, the two that stood out were that of Christian the leader and Luc the doctor. Lambert Wilson’s performance of Christian was excellent and the most intense. Often he said more in his scenes of silence than he did with his spoken parts. Michael Lonsdale’s performance of Luc the Doctor was the best supporting performance. There wasn’t a hint of phoniness in it. As for the monks as a whole, the most remarkable thing about the film is its ability to give three-dimensional portrayal of monk characters. The film not only showed them in their prayer life but also showed the devotion during their prayers. The film showed them in their occupations and how important they were to the village. The film showed their convictions and their beliefs. The film showed the bond between the men. Above all, it was alll done in a three-dimensional manner. This is very rare for a film to accomplish that feat. Even back during the days of the Hays Code–where one of the rules was that religious figures were to be depicted in a positive manner–religious figures were still two-dimensional at the most. Even the negative depictions of religious figures that came once the Hays Code was dropped in the 60’s as ‘censorship’ or ‘restrictive of creativity’–were also two dimensional and often too stockish. This film has to be the most realistic and inside-out portrayal of religious characters, in both character and their vocation, that I’ve ever seen on the big screen. Even 1997’s The Apostle doesn’t compare as Robert Duvall’s portrayal of a minister had more focus on his passion and personal demons than on his vocation. Also vital is the ending of the film. It is not known who exactly killed the monks. An Islamic extremist group has claimed responsibility but recent documents from the French secret service claim that the Algerian army carried it out as a mistake during the rescue attempt. The film doesn’t pick one group at fault as the monks are captured in the dead of night with the darkness hiding their identity. There may be some nervous in seeing this film, feeling it might try to ‘convert’ them to Catholicism. For the record, director Xavier Beauvois has not directed a religious film in the past. One thing we should note is that while the monks lived at the monastery, there’s no scene of them trying to convert any of the villagers from Islam. In fact Brother Christian was as knowledgeable about the Koran as he was about the Bible. When religion extremists threatened to shoot the brothers in one instance, Brother Christian quoted a passage from the Koran which caused the leader to drop his gun and order his followers to leave. I believe Beauvois wanted to show that for the monks, the faith was mightier than the sword. Also in the script was a scene where the monks talk about the difference between the Islamics and ‘Islamists’. This is good for a time when religion faces a lot of flack from religious dissenters. I believe that may have been another point from Beauvois that it’s important for one to recognize the believers from the ‘beliefists’. This film has won a lot of accolades. It won the Grand Prix and the Prize of the Ecumenical Jury at the 2010 Cannes Film Festival. The Grand Prix is second to the Palme d’Or as the most prestigious award at the Festival. Other nominations and awards have followed such as wins at France’s Cesar Awards, nominations at the European Film Awards, nominated for Best Film Not In The English Language at Britain’s BAFTA awards and was France’s official entry for the 2010 Academy Award for the Best Foreign Language Film category. The film was well received by critics here in North America and has a 91% approval rating at Rotten Tomatoes. Although this is a movie that makes for excellent viewing for Catholic communities, it’s not completely 100% ‘safe’ for everyone. There is a few profanities utters, including one by a monk. There are also some scenes of violence. The most violence is the scene of soldiers being cut at the throat by the extremists. Most of the violence is only seen through news footage. I realized coming (to Hollywood) that it’s not so much Hollywood is persecuting the Church as much as it was the Church was committing suicide in Hollywood. Big difference. So I basically wrote an article about it saying that Hollywood isn’t anti-Christian as so much as it’s anti-bad art, and we’re just giving it schlock. She states a major hurdle here as all too often a lot of Christian writers have written a lot of scrpits viewed by Hollywood as sub-standard in skill while the more liberal writers seem to know how to write for the screen. It’s a hugely difficult task to write a film of positive values or strong faith for the general audience without crossing the line of being schmaltzy or manipulative. Of Gods And Men shows that it can be done and it’s just a matter of learning how to do things right. If you’re fortunate enough to have it come to your city, I highly recommend you see Of Gods And Men. Even if you don’t buy the Catholic faith or want a movie with preachy religious themes, it’s a film worth watching. It’s as much about people and their devotion to their beliefs as it is about an incident that happened. Even with the tragic ending, it tells a lot about the human spirit that will stay with the viewer once they leave the theatre.